My tiel also hates wind. Sometimes when it's hot, I put the fan on (not a ceiling fan) and if I stand where the cold air is blowing out and hold my tiel on my hand, he gets scared and flies around like a maniac. luckily I don't have any ceiling fans because most of the time it's all wind and rain here in England. I live in a double, and each bedroom has a ceiling fan. Mine is off, and Conrad is not allowed in my roommates room. (Neither am I ) I use a table top tower fan to keep cool. Lately Conrad has taken to flying up to the fan and growling at me when I try to take him down. I guess I should just ignore him and give him lots of attention when he comes back down. If parrot poop gets in the vent on top of a ceiling fan, can it harm the mechanism? My shoulder is not complete unless a bird is resting there. It will dry and crackle off. Proud slave of Saga and Cirino, and missing Yondo and Egon. my timneh has been aware of the the fan for 4 years and goes nowhere near it, he also goes anywhere he wants to go in the house but stays away from the stove as well, i know it's a conscious choice because he seems to understand these things are dangerous for him, i also have a wood stove that gets hot and he won't go near that as well, but that is this bird, i always say safety first, look for places he can get his feet caught in such as the tops of those round cages that have the wires that run vertically to the top centre, they can get their toes caught on the top,also my congo came with a large key ring attached to her cage and opened it with her beak and somehow got her toe pinched in it, so they are dangerous as well. Myrtle is my only free flyer in the house. She caught her wing tip once and learned to stay away from anything with moving air. Yesterday she was on top of the door when I turned one on just 3 feet away. I saw a click in her expression that she now understands what they are. 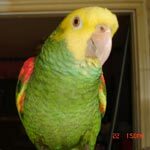 Michael wrote: Ceiling fans are a concern with flighted parrots so I wonder how many owners of clipped or unclipped have them. Or I should rather say use them. They are pretty harmless if never used (unless by accident). So let's have a vote and then post about your parrot (clipped or not) and how ceiling fans play a role for flight. Vote yes only if they are in any way relevant to parrot. If you have them in rooms the parrot never goes to (unless it's specifically because of the fans) you can vote no. Ceiling fans are a great way to cool down a room, but pet bird owners need to be especially careful when they are in use. Pet birds have been seriously injured and/or killed after colliding with the blades of a ceiling fan. Diligence is especially due if your bird is free-flighted or able to gain enough lift off to reach ceiling fan level. 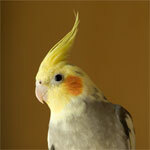 (Cockatiels are especially adept fliers and can often fly within a couple weeks of having a wing feather trim.) Play it safe, and keep your bird in his or her cage or in another room while a ceiling fan is in use. I have 4 celing fans and they’re all disabled at the fan. No ceiling fans here, either. I LOVE them but the only rooms that have them are two bedrooms because the birds never go into them [well, actually, Isis goes into mine all the time but the fan is never on when she does because it's only turned on at night during the summer].